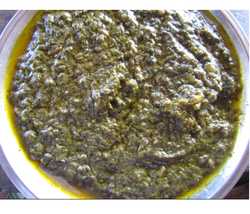 Our range of products include sukha saag. Prepared from fresh mustard leaves, Sukha Saag is widely applauded for its excellent benefits for hair, skin and health. Demanded for its medicinal value, this saag is excellent in taste and aroma. Prepared under hygienic conditions, sukha saag is provided in airtight packaging, to prevent dust and other contaminants.